DHS continues to extort participation in REAL-ID database | Papers, Please! DHS continues to extort participation in REAL-ID database – Papers, Please! In almost all cases to date, the DHS has backed down, by exercising its standardless discretion under the REAL-ID regulations either to certify that states are “compliant” even when they don’t comply with the statutory criteria in the REAL-ID Act, or to grant extensions of time to comply. 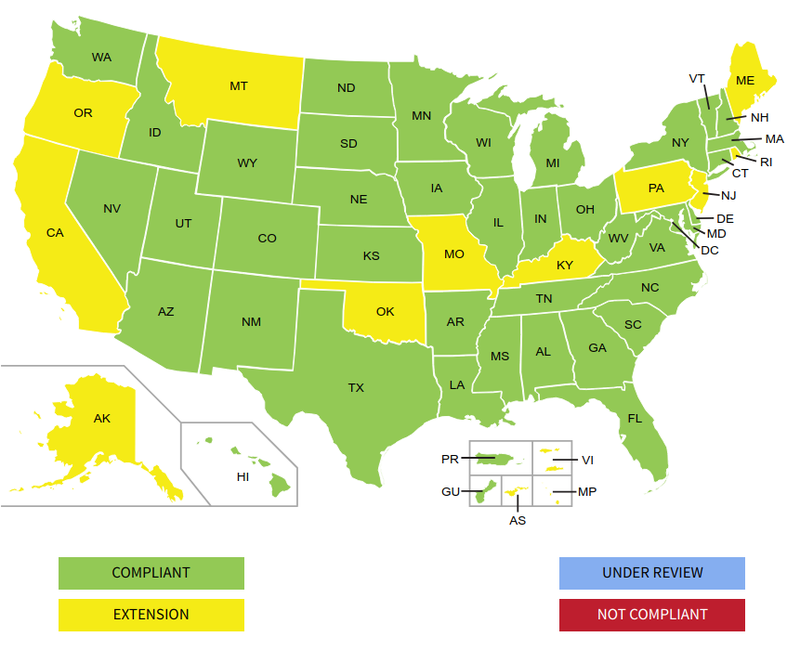 Compliance with the REAL-ID Act requires making information about all state-issued drivers’ licenses and ID cards, including “noncompliant” licenses and IDs, available to all other states — which is only possible through participation in SPEXS. 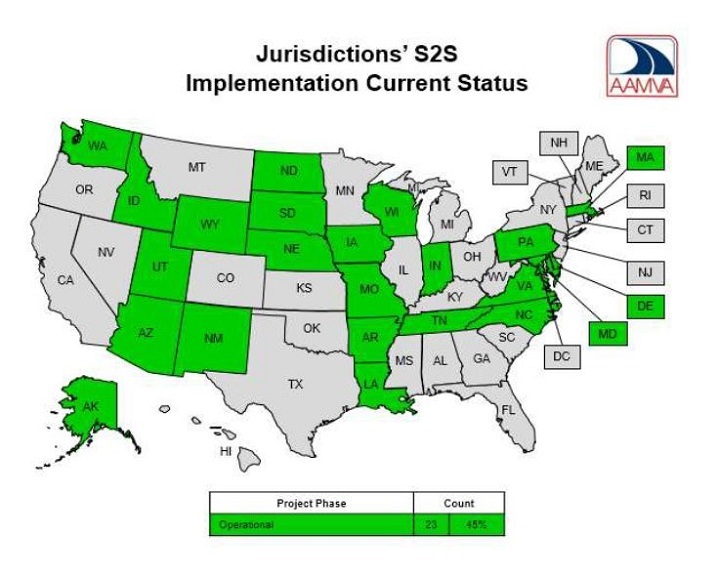 So no states or territories other than the 23 shown in green in the map of SPEXS participants above could possibly be deemed “compliant” with the REAL-ID Act. Almost half of the states and and territories certified by the DHS as compliant are not participants in SPEXS, and could not be deemed “compliant” on any factual or statutory basis. The DHS has given all of the remaining fourteen states and territories extensions of time to comply (or to demonstrate sufficient submissiveness to be deemed compliant, even if they aren’t). Those extensions have been repeatedly extended, although often not until the last minute. Only once — briefly, in the smallest of US territories, and in the only jurisdiction subject to the REAL-ID Act where local residents aren’t US citizens — has the DHS allowed an extension of time to comply with the REAL-ID Act to lapse. For about six months in 2018, the DHS declared drivers’ licenses and IDs issued by American Samoa to be unacceptable at TSA checkpoints, including for the two flights a week between American Samoa and the rest of the states and territories under US jurisdiction. But even then, the DHS stopped short of denying transportation to travelers with American Samoan IDs, merely subjecting them to additional harassment at check-in. (The DHS still has not begun to respond to the FOIA request we submitted almost a year ago for its records of how many travelers were affected and how they were treated.) And even though American Samoa still hasn’t uploaded its residents’ data to SPEXS, it was eventually given an extension of time to comply. The government of the US Virgin Islands had announced that it wanted to comply with the REAL-ID Act, and got $2 million in DHS grants ($20 for each of the 100,000 residents of the USVI) to bring its systems and software into compliance with the REAL-ID Act. But in June 2017, the former Director and MIS administrator of the USVI Bureau of Motor Vehicles and the former CEO of the prime contractor, BIZVI (now the CEO of a Boston-based ride-sharing app company) were charged with embezzling the $2 million in DHS grant money through fraudulent billing for work that was never performed. The three defendants were released pending trial. Eighteen months later, the charges remain pending. The DHS grant money is gone, and the DHS obviously doesn’t want to hand out another grant for the same purpose. But the USVI government says it has no other source of funding for REAL-ID Act compliance. No, this latest episode in the REAL-ID Act compliance follies is not an April Fools joke. As of last Friday afternoon, the DHS was still considering whether it would grant the USVI another extension today. If the DHS doesn’t grant another extension today, the USVI could become another slightly larger DHS experiment in REAL-ID Act enforcement at TSA checkpoints, building on the one last year in American Samoa. The USVI has a population about twice as large as American Samoa, but many more than twice as many flights to other US territories and states. Most of the traffic on flights between the US mainland and the USVI is by tourists from outside the USVI, however, rather than by USVI residents. And many of those USVI residents who travel outside the territory are likely to have passports, in order to be able to visit nearby islands that are either sovereign or governed by countries other than the US. So it isn’t clear how many air travelers would be affected by non-acceptance or special procedures for acceptance of USVI drivers licenses and IDs at TSA checkpoints for domestic flights. Larger questions remain about whether the DHS will grant a further extension (or a baseless certification of compliance) to California within the next ten days. Two days after the fact, the DHS website has been updated to indicate that on April 1, 2019, the DHS “certified” that the US Virgin Islands are “compliant” with the REAL-ID Act. In fcat, the USVI are not, and could not be, compliant with the Federal statute. The USVI does not share drivers’ license and territorial ID data with all states and all other territories, and has no way to do so. This could be done only through SPEXS, but the SPEXS governance body has not yet established any policies to allow US territories to participate in SPEXS.